My dear friends celebrated their 25th Wedding Anniversary at the weekend, and they had an intimate meal with close friends and family. Linda wanted some small discreet flowers for the tables. 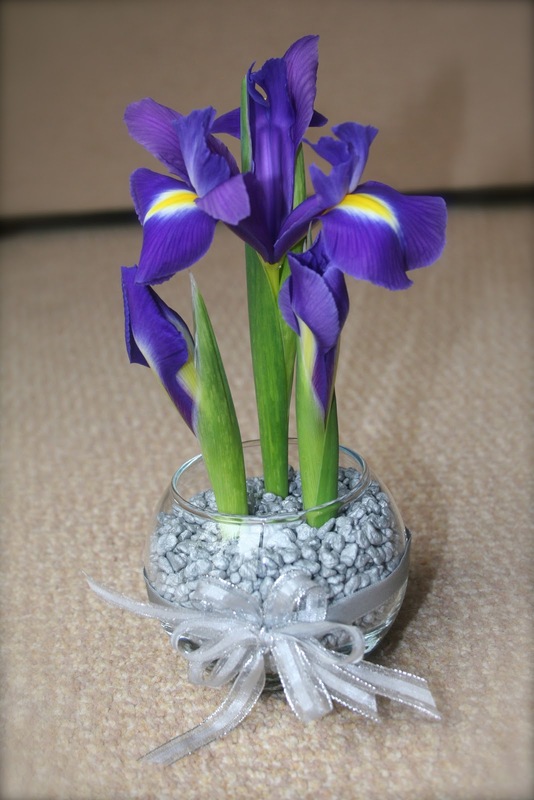 The Iris is the flower that symbolises the 25th year of marriage, so I made these cute little arrangements with silver pebbles and ribbon. Congratulations Mike & Linda. Thanks for including us! Wow, so much has been going on. I have my new work space almost complete! I am so excited to have a dedicated zone where i can work my magic on beautiful flower arrangements! As the new year has started, new brides are coming forward for consultations, and that is very exciting. I am also starting to prepare for the wedding fair next month. You can find me at Dianas club in wellingborough on Sunday 10th Feb. Opens to the public at 11 till 3. Please spread the word and come and say hello. More news about that soon.